The jumping-off segment finds an astronomical researcher, Henri, and his wife, Sonia, trying to read while their toddler Arnaud is in his bedroom crying for a snack or a story. As Henri (James Patrick Nelson) buckles under the whining, Sonia (Claire Curtis-Ward) holds to the stern bedtime rules—no food in bed, only one bedtime story. Nelson establishes Henri as a nebbish with a jellied backbone as he tries to mediate the demands between Arnaud and Sonia. Then the doorbell rings, and the couple realize that they have mistaken the date: it is the night when they have invited Henri’s intimidating boss, Hubert Finidori, and his wife, Inès, to dinner. They have only snacks and chocolate in the house, but they make the best of it. 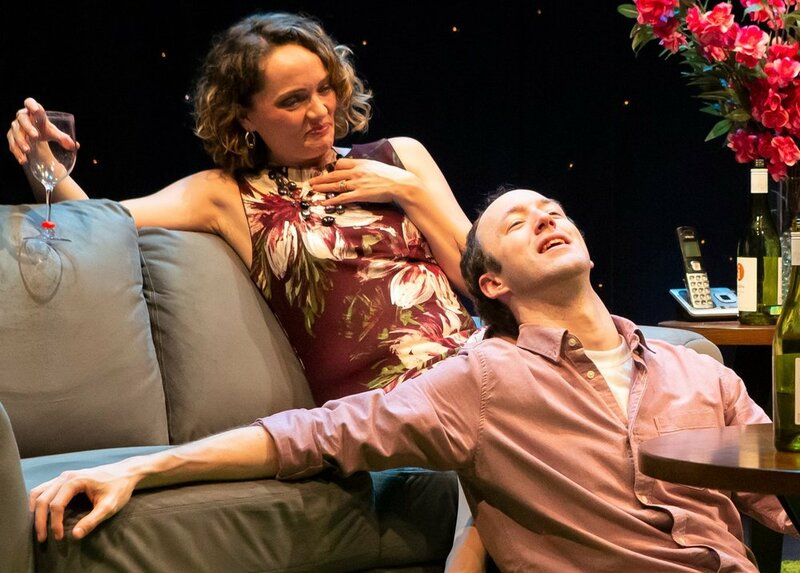 James Patrick Nelson and Claire Curtis-Ward play Henri and Sonia, hosts of a disastrous dinner party, in Yasmina Reza’s intellectual comedy Life x 3. Top: Nelson with Leah Curney as Inès. Hubert, played with a sanguine arrogance by Dominic Comperatore, brings worrying news to Henri, who has a final draft of a scientific paper that he’s ready to publish after three long years. Some other scientists seem to have just published a paper on his very subject, says Hubert bluntly. As Henri’s emotional fragility implodes—“That paper is my scientific death warrant,” he says—both Inès and Sonia come to Henri’s defense, as Reza wittily shows the limits and loyalties of marriage. Sonia: You could have warned him some other way, used words which would just leave some vague, inconspicuous scent in the air. Hubert: My dear Sonia, we’re in the realm of science. Words are not aromatherapy. Meanwhile, Leah Curney’s feisty Inès has ideas about child-rearing that she offers to Henri and Sonia, in spite of Hubert’s warnings to mind her own business and his suggesting that she speaks out of turn because of a drinking problem. The playlet ends with Hubert defeated and Arnaud triumphantly watching a videotape. Inès and Henri eventually find they are emotionally more in tune with each other than with their spouses. Photographs by Hunter Canning. Although Hubert remains the “villain” of the piece, the character becomes more garrulous and less successful as a provocateur. His wife and his hosts all call him out, and Henri stands up to the overbearing Sonia as well. That may be Inès’s hope, but the plays here demonstrate that, whatever control one has over one’s destiny and home life, the result is the same. Henri may find the strength to kick Hubert out of his home, but he is no more important in the galaxy for all that. Though Life x 3 seems to be about a playwright testing her quiver full of artistic tricks, they disguise a work that has more depth than is immediately apparent. Yasmina Reza’s Life x 3 runs through Dec. 8 at Urban Stages (259 W 30th St., just off Eighth Avenue). Evening performances are at 7:30 p.m. Wednesday through Saturday. Matinees are at 3 p.m. on Sunday. To purchase tickets, visit newlighttheaterproject.com.